A fistful of Beltane | Where's my backpack? Lá Bealtaine, the ancient Irish May Day festival, is fast upon us, and it is a time of year when faeries go into overdrive, much like they do during the festival of Samhain. In olden times, great bonfires were lit across Ireland on the eve of Beltane and households would extinguish their own fires; rekindling them later with new fire taken from the ritual Beltane fires. To keep cattle safe, herds would be driven along a path between two bonfires – the smoke from the fires was believed to purify the cattle and protect them from harm, ensuring good yields of milk for the coming year. Cows were also adorned with yellow flowers such as gorse, cowslips and primroses, all that yellow presumably evoking the yellow fires that protected against evil. With all that Beltane magic afoot, the Celts had a few tricks up their sleeves to protect their houses from mischievous faeries too. 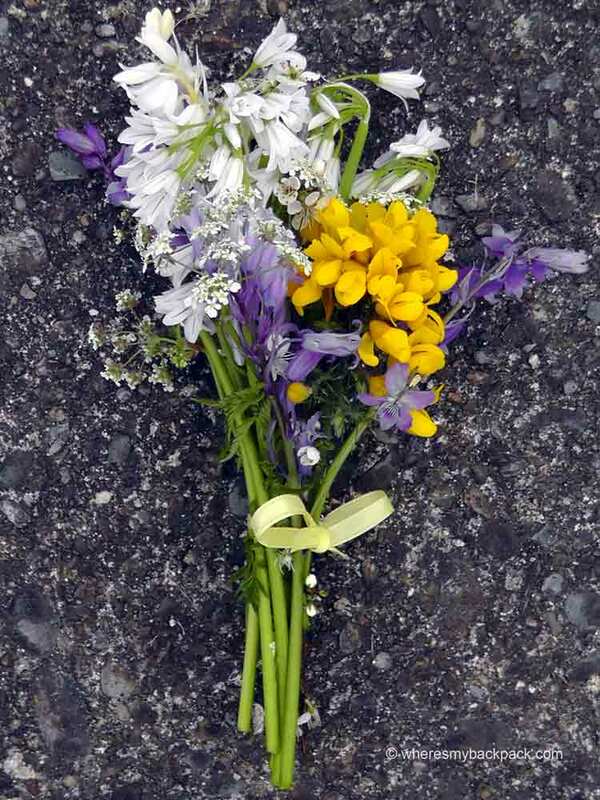 Pouring milk across your doorstep was said to prevent the ‘wee folk’ from getting into your house and causing trouble, and another way to appease those tricky faeries was to rise before dawn on Beltane and gather a posy of May flowers to hang on your door post. This Beltane eve I found myself unable to sleep, and as the first blue-grey glimmer of pre-dawn lit the sky, I slipped into the dewy garden and fashioned a posy of wild garlic, gorse and bluebells on the off-chance some impish sprite was keeping me awake. Wishing you a safe and happy Beltane filled with flowers, fire and appeased faeries. This entry was posted in Ireland, Photography, Travel and tagged folklore, history, inspiration, photography, photos, pictures, travel, writing. Bookmark the permalink. Wishing you a happy Beltane. Thank you for the reminder. I’ll have to see what I can find around these parts. Happy Beltane. Love your flowers and your info too. Pingback: What Is A Faeriemancer?